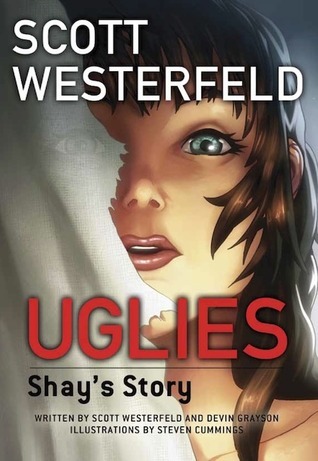 I don't typically read graphic novels (aka I've never read one in my life), but when I saw this was an addition to Scott Westerfeld's Uglies series, I knew I had to give it a try! I love the Uglies books, so any new view I'm given into the awesome world Scott created is something I love to see. When I first started reading it was tough to adjust to the change of medium (getting lots of the story through pictures instead of words). However, after a few chapters in I stopped thinking about how different it was from reading a text book and was able to be completely immersed in the story. I loved seeing the pictures -- one of the things I was fascinated with in the Uglies series is all the technology Scott created. It was super cool being able to see drawings of everything - the ping rings, hoverboards, crash bracelets, spagbol packets, etc. The whole story came to life on a whole new level through the illustrations. The only issue I had was that it was difficult to see the differences between the Uglies, Pretties, and Specials -- they looked pretty similar, except minor details. When reading the series, I imagined the differences to be much more vast then they were in the illustrations in Shay's Story. This book drastically changed my perception of Shay. It's been a long time since I read Uglies (six years I think!) but I remember thinking that Shay was overly jealous and easily angered. When reading from Tally's point of view, I sympathized with Tally, not Shay. But getting to see the story from Shay's point of view totally changed my opinion of her! I understand now why she was so upset about Tally and David's relationship, and fully sympathize with her feelings. It makes sense why she was upset, and feeling like things weren't working out fairly for her. This book is a MUST READ for fans of the Uglies series! If you haven't read the Uglies series, I recommend reading the series before reading this part. Great work, Scott!! Looking forward to the next installment of Shay's Story.